Mary Kunz Goldman blogs daily while writing Leonard Pennario's authorized biography. This is the story of my life in Buffalo, N.Y. where I write and draw. I am finishing up the biography of the great American pianist Leonard Pennario, a massive project I began 11 years ago when I had the unbelievable good fortune to get to know him. I also love to sketch. The blog on this page features my adventures in art and other things. The Music Critic blog -- click the link on the right and down a bit -- has my thoughts on music. Thank you for visiting! Zut alors, I did not weigh in on the Web log yesterday because my computer was kaput. Howard built me a new one. He is a clever man! It is fun to have a fresh computer. It is like a new start. Howard took pictures of all the components that went into the computer, including a vintage 1980s keyboard. Why are we talking about computers anyway? I need to get out. All day yesterday I was cleaning the house. I was trying to follow the Roman New Year's custom that the priest at my church told me about. In Rome they get rid of all their clutter and all the stuff they don't use. It is high time I did that with my life! So I am trying to do that. But there is so much clutter! At one point in the living room I almost burst into tears. There was clutter wherever I looked! That serving cart I bought a few weeks ago at that estate sale, there was even clutter on that! My computer was pretty much kaput anyway so I could not work so what the heck. Before the computer fritzed out I worked and I wrote this big long chapter about Leonard Pennario in the late 1940s. It was funny, that chapter appeared by magic. Between all the Christmas going-out and all the cookie baking, suddenly there it was. I wish my housecleaning could be accomplished so easily! Oh my gosh my golly. Wandering the Web I am finding proof of what the padre was telling me. He told me that in Italy it is an old custom actually to throw your old things out of the windows on New Year's Eve. Now I am on about.com and I am finding that is true. They throw their stuff out of the windows! Not only that but they listen to classical music. 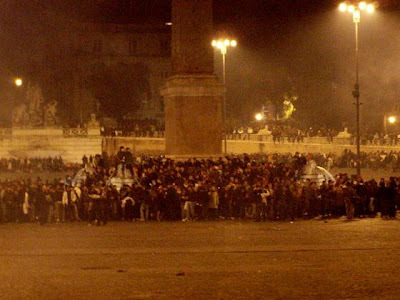 I am reading that in Rome a huge crowd turns out in the Piazza del Popolo. "They celebrate with rock and classical music and, of course, fireworks." That is a picture up above of New Year's Eve in the Piazza del Popolo. You listen to rock and classical music and then you go home and throw your stuff out of the windows! Of course in Buffalo everyone would be going around picking up the stuff other people are throwing out of their windows. We would all end up with more clutter than we had to begin with. One time back when I was married, I did that. Throwing stuff out the window. And it was not even New Years. It seems my ex used to love to antagonize me by running the vacuum cleaner all around me just when I got home from work and plopped down in front of the TV with a huge glass of alcohol. Well, on this day, she waited too long and I was on glass number x+1. Having had enough of it all, I grabbed up the vacuum and pitched it right through the window, glass and all. She looked at me like something was wrong but, it could not have been more right. Maybe that is one of the reasons I am single today? Not 'out the window', but 'through the window'! Needless to say, I was mad. Not to mention, drunk as well. But, I am pleased to say that I gave up alcohol along with all other mood-altering drugs many years ago. Just wish I had done that before I lost everything except my life! Leonard Pennario, America's greatest pianist. "(MKG's blog) is bright, fresh and shiny. I'm jealous." "Your voice sounds just like Laura Ingraham's!" "There goes the neighborhood ;)"